Opuntia is a large genus of cacti distributed throughout the Americas. The genus is best known for the prickly pears, though some naming controversy exists over whether or not chollas—a separate variety of barbed cacti—are considered Opuntia as well. Prickly pears are cacti known for their spines: many have large, rounded spines while others have tiny, hairlike barbs that detach upon contact from the plant. Prickly pears are prized for their edibility, as they grow cactus fruit commonly eaten in Mexico and the American Southwest—however, be sure that any cactus fruit has been carefully cleaned if you plan on eating it, as the tiny glochids on the fruit can lodge in skin and are very painful to remove. The distinctive red-purple juice of the cactus fruit can also be used in drinks, candy, and jellies. Prickly pears bloom in mid-summer and can be grown ornamentally; however, they really only can grow in desert climates. 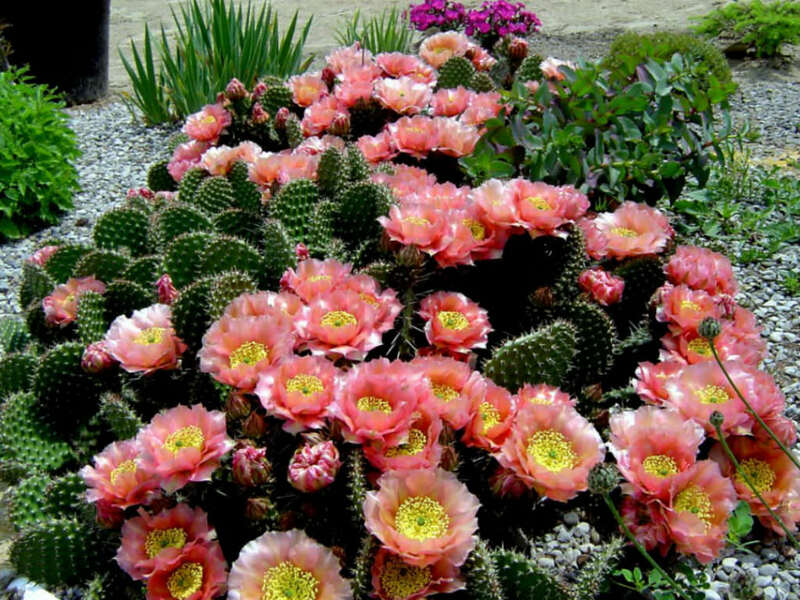 Lovers of cacti in a hot, dry area can consider growing plants of this genus. Light: As desert cacti, prickly pears require maximum sunlight to thrive and should be kept in direct sunlight whenever possible. Water: Very little water is required. These drought-resistant plants grow best in hot, dry areas and excessive water could cause them to rot. Temperature: Hot temperatures are best, but these cacti will tolerate a very wide range of temperatures. Soil: The most important soil requirement for Opuntia is that it drains well. Other than that, a basic potting soil is fine – these cacti will grow in rock gardens, as well. Prickly pears can propagate either by cuttings or by seed. To propagate by cuttings, sever pads from a plant and let them dry so that the wounds heal. Then place the plants in a dry soil and refrain from watering them until they begin to grow to avoid rotting them. To propagate by seed, rinse away pulp from the seeds, make sure they’re thoroughly dry, and plant – ideally in the spring. Again, the crucial factor in keeping the seeds alive and growing is keeping their soil well-drained and dry. Though Opuntia will grow just fine in a garden, they can be grown in pots as well. To repot, ensure the soil is dry, then remove the pot and knock away the old soil. After treating any cuts with fungicide, place the Prickly Pear in a new pot and backfill it with potting soil. As with a new cutting, make sure not to water a newly repotting prickly pear for a brief period to avoid rotting its roots.